Cincom is the leading provider of commercial Smalltalk in the world. 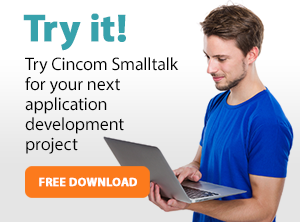 Cincom Smalltalk adds value and simplicity to application development software, web application development tools and deployment environments. Both Cincom® ObjectStudio and Cincom® VisualWorks® share the same core libraries and foundation. This means foundation improvements improve both products. The Cincom ObjectStudio and Cincom VisualWorks Foundation has major improvements. An ideal solution for developing custom applications for Windows®.